Home MTAANI NEWS Gatuanyaga MCA-Elect in hideout, claims his life is in danger. Gatuanyaga MCA-Elect in hideout, claims his life is in danger. Gatuanyaga MCA-Elect Joseph Kahira Wambui claims that his life is in danger. Kahira has consequently appealed to the authorities to provide him with security. 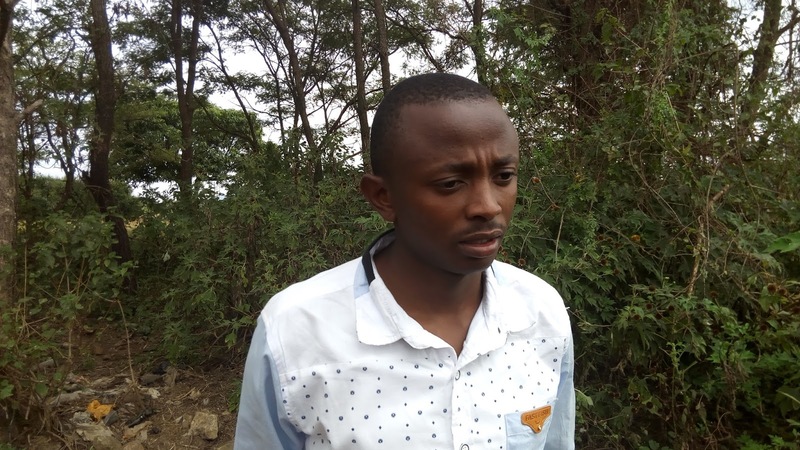 Speaking to journalists from his hiding place, Kahira (pictured) said that his ordeal started on the night of Tuesday the 8th immediately after Kenyans went to the ballot to vote for their preferred candidates. He said that that unknown men have been trailing him in several vehicles at his home in Gatuanyaga at night, raising fears that they are out to no good. “For the past few days, there are vehicles which have been trailing me everywhere I go. The first time we noticed some suspicious activity was the night of Tuesday after the vote. My younger brother told me that 3 people came in a saloon car through the rear gate to our compound and went straight to my house. After searching for some time he heard one of them tell his colleagues that I was not there. Immediately after that, they left without saying a word or letting anyone know of their presence,” explained the visibly worried MCA. He added that the following night at exactly 10:04pm, three vehicles got into the compound and some men went straight to his house and knocked. Luckily for him, no one was in as he had shifted his family to a different location and he was, at the time, at his mother’s house which is just within the same compound. “I peeped from the window and saw a tall guy in a cap trying to access my house. After several attempts to get in, he along with his colleagues just left. This time I didn’t get to know how many they were,” he said. He then called a friend and narrated to him of this second incident and both agreed that it was wise that he left the compound. His friend came for him after an hour and whisked him away to his hideout. Kahira says that they have not been able to establish the identity of the vehicles or the people involved since all this happening at night and it was dark when this occurred. He added that he too is yet to establish their motive. He has since reported the matter at the Thika CID offices under OB No. 39/12/8/17. “I would like police to get to the bottom of the matter by investigating to know who these people are and the motive behind their actions. I also appealed for police protection as I fear that my life and that of my family is really in danger, he said. 26 year old Kahira beat all odds to win the Gatuanyaga Ward seat on a Maendeleo Chap Chap Party ticket against the strong Jubilee Party wave that swept all the other four MCA seats in Thika Town Constituency. Kahira garnered 4 769 votes (49.07%) ahead of Jubilee’s Cecilia Wamaitha Mwangi who got 3 589 votes (36.93%). Kahira is a hawker who trades on coffee drinks around Muguga area. He says that he has been in this business for the last 6 years. “Hawking coffee has been my only source of livelihood for the last six years. It feeds my family and was my source of school fees in both secondary school and in college,” he says. His younger brother also depend on him for fees, courtesy of the same business. He is the second-born in a family of four. Their single mother, who currently does not have any stable job, also depend on him for her daily bread. Kahira is a certificate holder in Business Management and hopes to prove to other young people that anything is possible if only one focused in achieving their set goals in life.